Sinas Dramis established Lids for Kids — a community outreach program that distributes free bike helmets to children — more than 15 years ago. The event is held each spring in Lansing, Grand Rapids and Traverse City. To date, Lids for Kids has fitted more than 8,000 Michigan children with bike helmets, helping to protect them from head injuries. Since it was founded in 1951, the Sinas Dramis Law Firm has demonstrated a genuine commitment to improving the quality of life in the greater Lansing area. This tradition of community service began when Thomas G. Sinas and his law partner, Lee C. Dramis, were confronted with an unusual circumstance. A client of the law firm, a fruit and vegetable vendor, was unable to pay his bill for legal services. Instead of money, the client offered to give the Sinas Dramis Law Firm a truckload of bananas. The offer was accepted by Tom and Lee, who then borrowed the client’s truck and distributed the bananas, without charge, to needy families in the Lansing area. 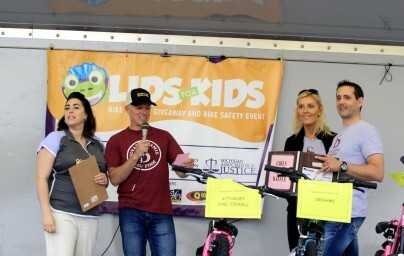 The event immediately caught the attention of the local newspaper, which published a story about the charitable efforts of the two young attorneys. The Sinas Dramis Law Firm is both pleased and proud to help our local Michigan communities, which give so much to us. Copyright © 2019 Sinas Dramis Law Firm. All rights reserved.